Why not take the party outside and create your own fabulous table setting with some simple but effective design ideas. I always use candles when dining and entertaining outdoors. They create a beautiful atmosphere as the sun sets and light up the garden and patio areas. Use what you have in the garden to add some colour to the table along with the flicker of your candles. Below are some very simple DIY table settings for your next garden party! Line a selection of small terracotta pots in the centre of the table or on the ledge of a small wall in the garden. In each pot place a pillar candle or a mix of seasonal foliage from the garden to create this rustic look very simply. Add some cut lavender if you want to add some colour. For a more retro dining experience cut some rosemary from the garden and place in some Mason or jam jars. Add a slice of lemon and lime, fill with water and place a floating candle on top. Not only do these jars look great they also keep insects away while dining! Berries and mixed foliage could also be another alternative for this type of table setting. For a pretty table setting collect a few different sized glass jars or vases. 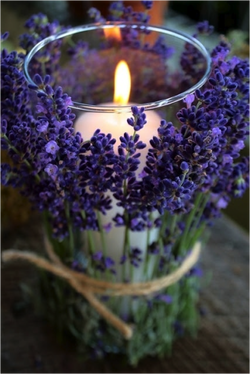 Place a candle or tea light into the jar. Pick some lavender and rosemary from the garden and trim to the size of the jar. Tie around the edge of the jar with some string or coloured ribbon to create a simple but beautiful setting for your table. I like to use different size jars and mix up the foliage on each one to create a more vintage feel.